Can you believe it? 28 Days of Love is coming to a close today. Over the past 4 weeks we have connected with our heart, mind, body, and home/living spaces to find clarity and bring ourselves into alignment with the energy of love. How do you feel? Take a moment to integrate the information and lessons that you have learned over the past month into your life completely. It may take some time to feel and know what changes you have made or may still need to make. Behavior and thought process changes enhance our states of being. Above all else I hope that this time has brought about compassion for yourself and others. Love is so much more than warm fuzzy feelings. It is the basis of our existence. Through love we find ourselves. Through love we find our purpose. So I send you forth with love, always and forever. I hope you all are doing well! Today we look at the second Universal Law of Vibration. I know you all have heard that all that exists is comprised of energy. That energy consists of vibrating molecules and atoms made up largely of space. Vibration rings out from our thoughts, movement, bodies, hearts, and souls. Everything is vibrating and when these energy currents meet they either will be in harmony in consonance or out of harmony in dissonance. Vibration does not know morality or emotions. It only knows the frequency with which it moves. This is what we have associated with thoughts, feelings, and items. We as spiritual beings have chosen terminologies to understand the vibrations that we experience. Why is vibration important then? Well the vibrations that we emit will either bring harmony to our lives or dissonance depending on the vibrations that it comes into contact with. Have you ever met someone and immediately clicked? Saw a painting and felt that your entire soul had been placed upon canvas? Heard a phrase that made you catch your breath and fill with wonder? This is the experience of vibrational harmony. At the same time we can meet people, be in spaces, have experiences which cause us to be immediately turned off, stressed, or angry. This is the experience of dissonance. Later we will touch on the Law of Attraction, but right now we must understand the role that vibration plays in all things. I challenge you then to extend your consciousness outside of yourself. Be the book, pillow, tomato, car, leaf, frog, cloud. These all emit vibrations as well. Sending out their drives, desires, and soul. Their being vibrates. It moves outward and pulls others in. It is without judgement simply looking to find waves that matches with it’s own. This sounds a bit trippy doesn’t it? To picture the energy that emit from the core of these different beings. There is energy to comes from your pen, your laptop, the individual keys on the keyboard, the light that comes forth from the screen, the battery that powers your computer. Every bit vibrates. You may hear the advice to raise your vibration in order to bring to your life experiences that are joyful, fun and more desirable. Let us focus here on being aware of what our vibration is through being aware of our thoughts, feelings, and experiences. Take note of when you are happiest, excited, feel loved, thoughtful, confused, angry, hurt, jealous, etc. See what the circumstances are that surround the experiences that you have. This will be your vibration treasure map. It will guide you towards knowing relationship between vibration and your feelings, thoughts, and experiences. By knowing your vibrations and yourself you can also learn the vibrations external to you. Do you find that you have different feelings associated with the same experience? Why does one differ from the other? What happened prior to this? After this experience? Love, fear, anger these never will feel exactly the same as they have various degrees of expression because they vibrate on a never ending spectrum of variety. Awareness helps though. To be aware means that we may need to slow down. Be present. Not tap to much into what may be coming or what has been. So do you know the vibrations you are extending now? Another way to get in touch with the meaning of vibration is through food. What do you feel when you eat certain foods emotionally? Physically? Does your body feel sluggish? Do you put on mass or release mass depending on the different types of foods that you eat? it is your personal state that sends out vibrations and either will mesh well with the vibrations of the food or not. These can change as well, thus why you may have been able to eat peanuts at one point and then no longer can. Then 10 years later you again are able to consume peanuts. Now there’s much more to this so please if you are allergic to something don’t just try to change your vibrations so you can eat all the peanuts or gluten you want :). The messages send out from the soul, form, being is powerful. Those vibrations reverberate throughout space and time. They continue on unless hindered or joined by another wave. It shapes our very lives and beings. I ask you then to be a bit more aware. Try it out and see what happens when you pay attention to your world and how you feel. See what trends you find. Are you ready to set that love energy coming pouring into your home by decorating according to Feng Shui? Then let’s get started. The number one important thing you can do is discover items that you associate with love. Are they seashells from your favorite body of water? Daisy’s from your garden? Soft peaches, blues, and green colors? Figure out what those items are and grab some so that when complete the arrangement of the items already in that space you can add these to personalize the energy you are sending out and receiving. Lights, Mirrors, Reflection: These items can be used to enhance space, lighten up the energy in a room, reflect negative energy outside of the space or open it up for more light. Ideally you want to face towards a door or opening in a room but if that isn’t possible you can place a mirror in on the opposing wall in order to balance that energy. Are you finding that you are often feeling confused about what your relationships? Make sure you have a well lit ventilated love portion of the home. Sound: Feeling as if your love life is stuck? Then you may want to invest in some bells, chimes, or fountains. These items encourage movement of energy. If you find yourself in a sexual rut the flowing sounds may be what you need to get the juices flowing. Color: We’ve spoken here before about color magic and it functions much the same in Feng Shui. Determine what you want your love life to include and then use those corresponding colors in this portion of the home. Plants: Plants can bring life and movement to an area that has stagnant energy within your home as well. They can also disrupt the piercing energy of corners that stick out into the room disrupting the flow of energy. Flags, statues, swords, fans, or large stationary objects: These and other objects like them can be used to slow down energy that is moving too quickly. For very large rooms with lots of windows or long hallways this may be letting energy flow out faster then it is generated. If you find that your relationships flow in and out of your life quickly add something large and concrete to the love portion of your home to stabilize that energy. Altars: Another way to create this stability is by creating a love altar in this portion of your home. 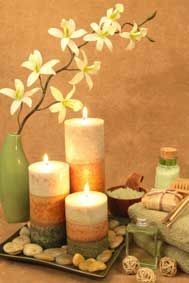 Invite the elements in with items that symbolize love for you such as candles, incense, stones/crystals, bells, water fountains, or feathers. Remember if you desire to have a partner or partners to include this as a part of your altar and portion of the home. Make sure you have all things in pairs or whatever number you feel works best for you. Perform maintenance and rituals that honor love at your altar to concentrate your energy and desires. This can become a form of self-care for you and if you like your partner. Above all else make sure that this portion of your home feels warm, inviting, and nurturing to you. This way your relationships will reflect this back to you. Now that we’ve found the love and relationships portion of your home I know you can’t wait to start arranging the items in that space in order to have the most inviting energy present in that space. So here are some tips to Feng Shui some love into your life. First what type of room is this? For many this may be a bedroom, family room, bathroom or is that portion missing in your home? The function of this room plays a large role in the energy that exists there. Determine the design of the room. What is the entrance to that space like? Is it a door, hall, or open space? Are there windows? If so what direction do they face and where are they located in the room? What about closets? Look to see all the design elements of the room so you know what you are working with. Now spend some time in this space. How does it feel? How is the room decorated? What’s in the room? Are there things in the space that can be changed or improved? What things do you like about the room? What do you dislike about the room? Ideally what do you want the room to feel like? Once you’ve completed answering these questions you’ll have a pretty good idea of where to start improving upon the love portion of your home. Tomorrow we’ll look what items to use to decorate the love portion of your home to correct any issues you may find in the space. How did you enjoy the decluttering activity? What was your experience going through the items in your home or living space? Did it make you think that perhaps you may need to start going through other spaces that you inhabit such as where you work or your car? I find that once I begin to experience the change and ease that comes with removing items from my space, I soon want to experience that in all areas of my life. If you feel called to perform the decluttering activity in other portions of your life do so. Now that you have spent time with the items within your home and cleansed your space as you feel called to we will look at the ways in which energy moves about the home. Let’s start with the basics, under the Chinese system of Taoism there are lies the foundation of the Ultimate as Creation/Matter/Earth in the form of a square and Heaven/Spirit/Sky as a circle that surrounds that square. That square of creation can be reduced to a broken line _ _ known as Yin. The circle can be reduced down to an unbroken line __ known as Yang. Thus we find balance through the Yin/Yang symbol. Here we find the Yang (Heaven/Spirit/Sky/Male) represented by white and Yin (Creation/Matter/Earth/Female) represented by black. One is never without the other which is why there is always a spot of each in the other. The Yang is at the top denoting the South with Yin at the bottom signaling the North. If we then look a the concept of the lines we find that by arranging the lines representing Yin/Yang we can symbolize the 4 directions. From there we can add a third row to denote the element associated with that direction as well. Thus we have three rows of lines featuring solid and broken lines. By adding an additional three rows we find ourselves at the IChing but that is for another day. If you would like a more detailed explanation of the directions, elements, and energy associated with them, I implore you to see out some of the many resources that exist online, in text, or in person. Here, we’ll move forward into the art of Feng Shui which utilizes understanding the flow of energy (Chi)in accordance with the system described above to design one’s living space to give you optimal luck and balance. 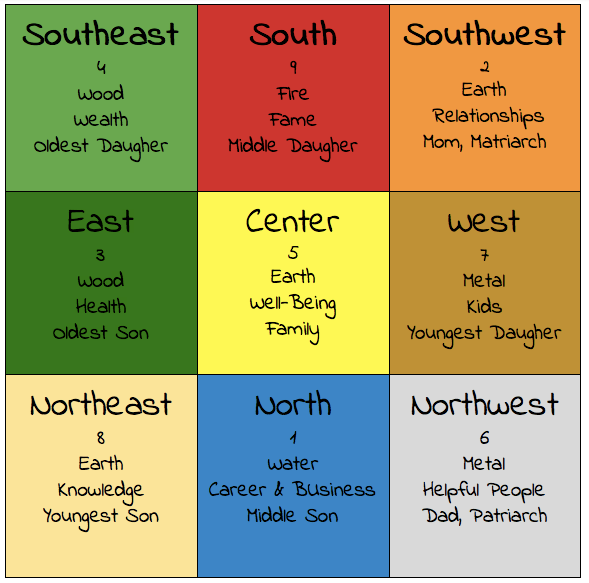 Each direction is known to assist the home in different ways. Taking these associations we can bring the nine sections of the Pah Kwa out into a square that can be divided into 9 known as the Lo Shu magic square. We can then overlay this square onto any home with the South at the top to see the energy associated there and determine what may need to be done to enhance that space. Now that you’re more familiar with the principles of Feng Shui, let’s find the love portion of your home. If you can grab a house plan or draw one of your home. Using a compass ascertain the direction your house faces from the front door. Then find yourself a Pa Kua or Bagua that you can lay over your house plan matching up the south locations. From there you can determine the sections of your home. The love and relationships portion of your home is to the right of the southern wall/room. For example if your front door faces north then the back of your home would be your Fame and recognition area. To the top right of that would be your relationships/love portion of your home. Now that you know where the love portion is we’ll discuss how to decorate and arrange the items in that portion of your home to bring you love and security. Strength, compassion, purpose, action. These are the key words of this new moon in Pisces. As the last sign of the zodiac, Pisces holds all the lessons that we have learned through the past new moons resulting in a variety of forms of integration. A mutable water sign represented by two fishes swimming in opposite directions. These fish represent the cycle of existence through thought/creation, hopes/despair, life/death. Pisces feel for the world. They experience the entirety of the emotional spectrum revolving through experiences. So often that is why we may find it hard to understand Pisces as they experience extreme highs and lows in turn with the universal flow of energy not as directly tied with their personal energy. In turn their gift is to bring this wisdom of emotional intelligence to the world. Ruled by Neptune, Pisces are the dreamers of our world. They exist with one foot in this plane and the other in the womb of creation and destruction. They create the space for new ideas, beings, behaviors, and worlds. They are unburdened and yet limited by the scope of what they perceive can be achieved in reality from the dream world they have created. Pisces represents the duality of the subconscious, where Gemini is the duality of the mind, Capricorn duality of the body/earth, and Sagittarius duality of behavior. Pisces home is the subconscious in consciousness. A state that others may have to work to engage in, for Pisces it is a natural flow. Yet the undercurrents of desire are in the shallow end as opposed to the depths of the ocean. There is not a need to dive when you can just stand. This new moon represents this strength that Pisces has from the lessons they have learned. It is the time to experience the fullness of our being in a space where we do not have to question our being or purpose. We have been defining who we are and in that exercise we have been releasing/cleaving to that which is in alignment with who we find ourselves to be. This is a time of action but not physical action through movement per se but through the inner work, through the emotional work. This energy highlights well the duality of Pisces as it is fiery emotional work to be done. Anger, rage, hate, despair, frustration, annoyance, pretty much just all the feelings of being done and over this current realty have been brought up to be dealt with. We are strong beings. We have survived through years of growth. Through that we have found how connected and yet disconnected we may be. The world is splitting into different realities, no one better than the other just different. We must determine which one we desire to come forth. We have dove into the depths of the underworld, the subconscious, and shadow. Now we have traveled back from the ocean to the shore with the knowledge and wisdom of the deep. Stand in these two states of land and sea. Of material and energy. Now look at the world through those eyes. See past the external projections that others put up to shield you for seeing who they really are. Understand that if one’s words, actions, and thoughts are not in alignment they are not being authentic and you in turn will not experience who they really are. If you are not in alignment then you are not being who you really are. This new moon calls us to come forth. To stand strong in our being. To realize that practicing compassion and love does not equate allowing those who harm your being to continue forth in your life. Releasing those who do not serve us is a kind way to express cutting off connections. This is a time for emotional, deep work, before we move into a time of rest and building up our resources with the full moon in Virgo. After which our plans will be put into action with the new moon in Aries. So if you are feeling called to meditate, pray, chant, write, read, or seek forms of counseling during this time follow that desire. We’ve been having some great discussion on the importance of cleansing and taking time to declutter our homes in order to create space for new energy to be cultivated. Today I’ll share a quick decluttering activity to get us moving. I’m sure you all have heard of the three fold decluttering law. Lol I know you’re thinking no, but believe me you have. From three piles we create space. By dividing into keep, trash, and donate. Pretty easy but that’s your activity for the day. Pick a surface, room, or portion of your home depending on your energy level and what your intuition guides you to tackle. From there you can pick a space or use reusable/trash bags to designate between the items that you will keep, throw away, recycle, or donate. Now this is an exercise that you want to provide plenty of time to complete because you will want to take a moment with each item that you encounter. For some it literally will be a quick second of regard if it’s an item that you have no attachment to and are sure of where you would like to place that item. Others not so much. Sit with the item and determine if you are thinking of keeping it what is your motivation to do so. Do you have an emotional connection? Nostalgia and sentimental value? Is it an item that you use often? Ask yourself these questions and determine whether you actually need to keep that item. If it’s an emotional response explore what that emotion is that is attached to the item and why. If the item is attached to emotions that you would not like experience then perhaps it’s time to place that item in the donate/trash pile depending on its condition. As you may have begun to notice, the items that hold space in our homes not only take up physical space but emotional, mental, and especially energetic space. So while you are going through your things keep this in mind that there is more tied to your items then just their physical presence. Clearing, moving, and cleaning gets this energy moving or completely removed from your personal energy so you are able to create room/space. Go over each item in the designated space you chose. Once that’s complete move all the items you have decided to keep and give the space a thorough cleansing. Repeat this process by moving from space to space and room to room until you have gone through your entire home or living space. Once that’s’ finished using smoke, sound, water, or whatever your preferred from of energetic cleansing may be clear your home. That’s our decluttering and energy clearing activity for the week. Here’s to cleansing, clearing, and manifesting! I hope you all are having a wonderful day. Spring is coming and I suspect everyone is beginning to feel the need to start clearing up energy in and around your home. 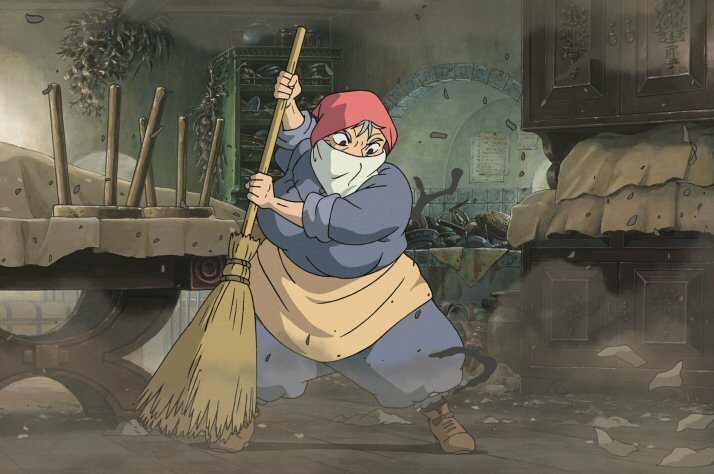 This may sound like a story that an adult would try to tell you to get you to tidy up but cleaning is a spiritual act. It is a physical act which literally moves energy. The act of cleaning and redecorating can allow for old energy to be released and new energy to be brought in. We focus a bit of time and energy on clearing our physical and etheric energy attached to our bodies and souls. It is important to take time to focus on clearing the physical space that you inhabit as well. If you find that you are feeling a bit stagnant, have a large goal you would like to achieve or are wanting to add a little oomph to your manifestations decluttering and cleaning can assist you in all these efforts. As we have discussed, energy is always being transmuted and transformed. When you have a desire that you would like to see come to fruition this requires energy that is currently being put to use in one area to be to be transmuted to another. For example, you may want to change where you are currently living but find it difficult to find a space that meets your needs, desires, or budget. It’s a great idea then to examine what the energy is like in your current location. Do you have a lot of items that you rarely use? Are your belongings ready to be moved or would changing spaces be a cumbersome stressful event? Is the space you are in clean and ready to be vacated? These factors all contribute to the flow of energy in your home and manifesting your goal. So what needs to be done to start the energy flowing towards moving? First, you may want to go over your belongings and see what you may be holding onto in that space which may energetically tying you to that location. Remove those that are not supporting your endeavor. Now it’s time to look at whether your space is ready to be vacated so start cleaning up. Begin behaving as if your manifestation has already occurred. This is the magic of clearing our space. It creates room for new things, energy, dreams to come forth. This same theory applies in the same way to our relationship to our self, others and the heart centered connection we have with everything. Supporting healthy, nurturing and love inducing connections not only performs the task of maintaining our relationships but either transforming or releasing those that do not serve us. Thus if you feel you are wanting more love either to give to yourself, others, or to receive it may be time to re-evaluate the state of the energy within your home or living space to see if it is putting out the message that you would like to deliver. If not then it’s time to start cleaning up and clearing out so that you create space for what you would like to have in your life. I hope that you will stop by tomorrow where we’ll be sharing a fun decluttering and energy clearing activity. Have a beautiful day loves! This month has gone by so quickly! I have to admit though I have been looking forward to this week since I started this project. 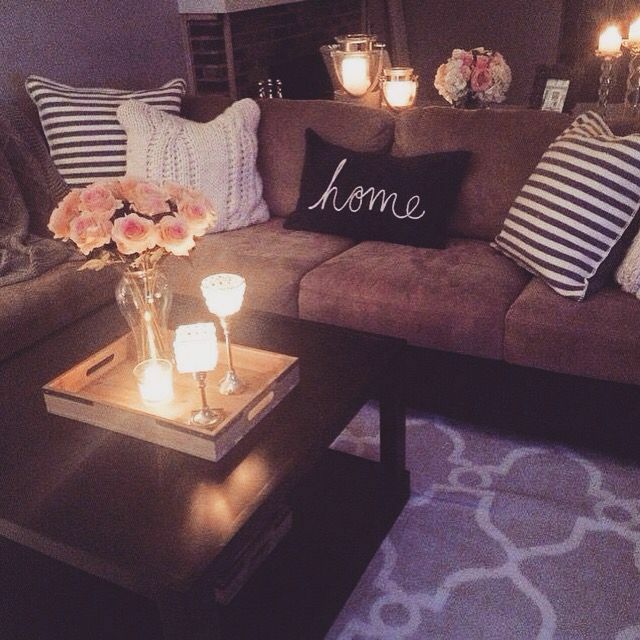 Week 4 is all about creating a loving heart centered living space. Why do I find this to be the most appealing topic of them all? Because our homes, living, work, cars, and other sacred spaces are the external containers of our energy. They can be the closest (or furthest which we will discuss later) to a safe space that one can encounter. Our homes have such powerful energy associated with them and can affect huge portions of our lives. Yet we are not always called to give them the attention and energy that they can require. When one is trying to stay afloat in a world gone mad maintaining and creating a loving container is one of the most important tasks that we can take upon ourselves to prioritize along with other self-care activities. Perhaps it’s time to check your self-care list and see if there are one or two activities that focus on the care of your home. Perhaps it’s time to start seeing our spaces that we reside in as extensions of ourselves and find balance in those energies. This week we will explore the heart and the home. The importance of cleansing our living space through clearing and decluttering. Then we will discuss a little bit of the ancient Chinese practice of feng shui so we will know about the relationship between energy, movement, and our homes. After which, we’ll identify the love and relationships portion of the living space in order to see how what we place or don’t place in that area may be affecting our hearts. Lastly, we’ll look at decorating our heart space in order to create the environment that will nurture and feed our souls. I look forward to continuing to build this loving space with you all. Today we’ll share an exercise to connect to your sacral and root energy centers. Let’s get started! Find a comfortable spot where you will be able to relax. This could be a chair, on a pillow on the floor, or your favorite place outside. Anywhere where you can relax, focus and not be interrupted is preferred. Settle into your space. Close your eyes. Focus your attention on your breath. Feel as the oxygen flows into your lungs, filling them with life. Envision all of your worries, all of the drama, all of your responsibilities of the day filling those bits of air. As you completely fill yourself with this deep breath hold it for 5-8 seconds. Really putting your attention towards instilling each other air particle with the stress that you intend to release. When you exhale envision all of those worries releasing to the universe where they are transmuted into refreshing air for the natural world. Continue these breaths 5-10 times or for however long it takes until you feel completely at ease. Once you have entered that space, center your attention on each chakra starting with your root chakra. Feel it pulse, pull, and draw round your etheric being. There will be a moment when you will feel that connection. It is different for everyone. If you don’t feel anything such as a wave of energy flowing in that area. Repeat this for your sacral, solar plexus, heart, throat, third eye, and crown chakras. As you move upwards through each chakra pull that energy along as you go. Some areas may feel sluggish, although this isn’t an exercise to clear one’s energy you may want to spend some time doing so. You may feel a slight buzzing around your head from this exercise. Continue to move that energy upwards past the crown for our energy fields extend much further than that. In fact continue to let you energy expand as far out as you desire. Now bring your attention back to your sacral energy center by picturing your energy flowing down thru your solar plexus down into the center of your pelvis to your sacral energy center. Having felt the flow of energy that exists between your higher-self and source letting that connection flow down to your sacral energy center brings the wisdom those spaces hold from your subconscious to your conscious awareness. Source who is outside of our limited scope of space, time, and physical forms is all knowing. 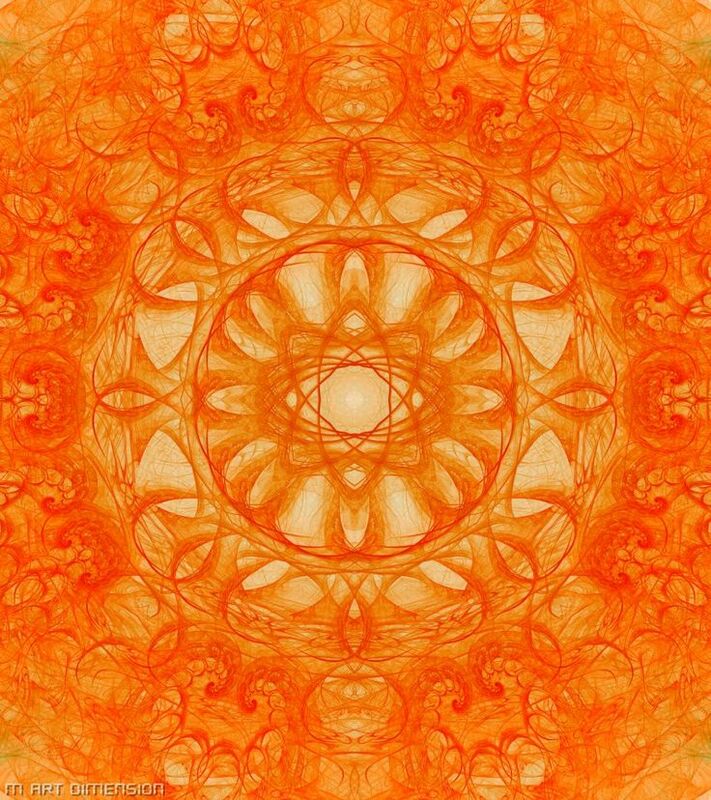 You will want to envision a steady flow of energy between your sacral chakra and your higher-self. This energy flow may be orange, red, yellow or any other color. Does it have a temperature associated with it? Is it warm, cool, or just a color? If you have a question or concern once that flow of energy is consistent feel free to ask your question. Note if there are any changes in the color or how you feel during this time. Does the answer come to you easily? Pay attention to how you feel but if you find yourself becoming too distracted and your mind is wandering then focus back on your breathing and trust that your message will come to you when you are ready. The sacral chakra is one of the areas in which we hold on to trauma so if you find yourself having a very difficult time connecting to this area don’t push it. Come at this exercise gently. Eventually you will find yourself able to explore the truths of this area. What wisdom does your sacral energy center have to share with you? Is it calling for a clearing? If so you can use cleanses through smoke, sound, water, or earth to pull any negative energy from this area. You may also want to seek professional services through therapy or a medical doctor. We will now use the same meditation to connect to our root chakra. The root chakra may have a more active feeling to it or a very Earthy feeling. The root chakra is the last of our main chakra’s before our energy connects to the Earth. Thus it’s characteristics of grounding is a logical relationship between the root and the Earth. The color associated with the root chakra is red but you may find you feel/see green, brown, gold, black, or any other color. You also may feel a cool, damp, or warm sensation. It really depends on where you are and what your current life experience is. Focusing your attention here may deliver to you messages on your home, your family, your finances, or life purpose. Be open to what these messages may suggest about your current state of energy in relation to these subjects. Breathe into them. Let the knowledge seep into your being. Rest in that connection. Do this exercise for as long as it feels comfortable. 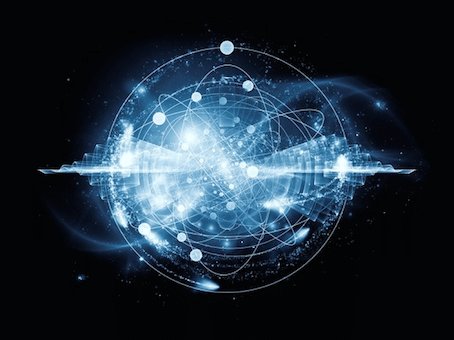 Once you feel complete you can picture your energy traveling down into the earth and up into source as a mutual connection builds between your being and the entirety of creation. Take 5 deep breaths and slowly let your consciousness return to this plane. You can always return to this exercise whenever you are desiring connection or guidance.